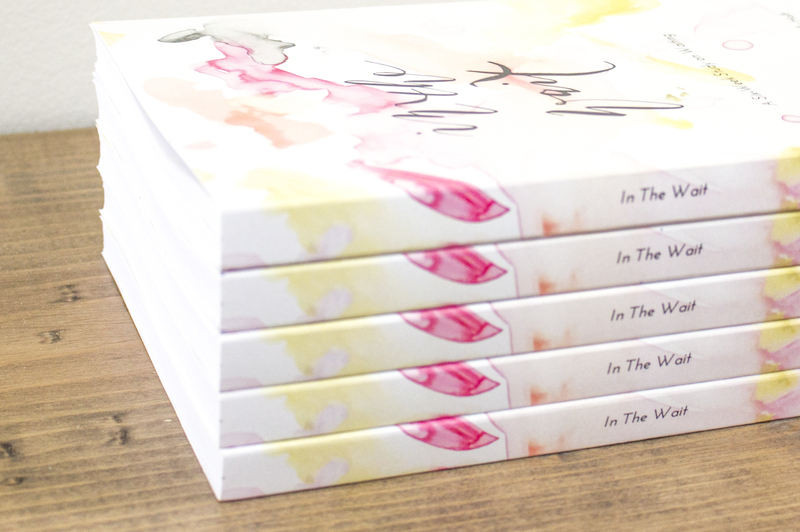 I am so excited to share with you that the In The Wait devotional has officially launched and is for sale now! I have been part of an amazing team of women – all talented, godly, fantastic writers – who have been able (through God’s grace) put into words what we have been learning through the seasons of waits life has to offer. If you are anything like me, you know that our lives seem to weave in and out of these seasons. Waiting for a spouse, kids, that right job opportunity. Waiting for your business to launch or your husband’s cancer to go into remission. It may be a an exciting wait! The wedding day is drawing near, your book is launching, you’re about ready to close on your new house! Perhaps it’s an mildy annoying season, like waiting for the end of a school semester or working to pay off a small, but tedious loan. More possibly yet, it’s a hard, stressful, painful one, wondering if your child’s health will ever improve, struggling through heart wrenching marital issues or dealing with infertility or loneliness. The reality is, seasons of wait have the potential to take our minds hostage and leave us exhausted and burnt out, feeling like we are living life in one big transition moment. Our goal in writing this study is to show that it is possible to take these seasons of waiting – exciting, easy, hard and painful ones – and grow closer to God in them. It is possible to live life FULLY while being in an unknown season. Each of the 5 contributing writers, myself included, have shared with you our own intimate stories, lessons we have learned and are learning, and Godly wisdom that we are taking away. We want to equip YOU to grow with us! This is an interactive devotional, meaning you get to participate through guided journaling (or doodling!) and prompted reflections on your own wait. You’ll be in the Word regularly, but don’t be intimated, you don’t need to be a Biblical scholar to go through it. All you need is a Bible (or a free Bible app!) and a pen. Then join us for 6-weeks as we partner with God to grow in the wait. Friends, this is all God. I re-read the words of each of these days and it’s so encouraging to my heart. We give Him ALL the glory for helping us pour our hearts into these pages. What has been sealed up in this 240+ page book is nothing short of Him. To be clear, this isn’t a devotional written for women struggling with infertility, although my story certainly is woven through the pages I have written. Instead, its for women of all ages who want to build a strong relationship with the Lord. Who find themselves worried or anxious, feeling overwhelmed in their current season. It’s for YOU, someone who dreams of claiming victory and living a joy-filled life no matter what your circumstances are. I ask and pray that you pause today and see if this is something that God wants you to be a part of. I would love NOTHING more than to be able to watch others grow in their relationship with the Lord during their own seasons of waiting. I know I certainly have a lot more growth to do and am excited to re-dive into these pages with each of you! Know a friend that may want to journey through it with you? Or two? Accountability is never a bad thing! :) Plus, it even comes with a FREE Small Group Companion Guide, making it easy to do in a small group. So what are you waiting for? Are you in Canada or overseas? Simply change your shipping option to International on Amazon for affordable pricing options. Thank you all – for your support, for your prayers, for your part in my own journey that has lead me to get on my knees and write out His truths. He provides us SO much power. I can’t wait to see what He has in store for you! Much love! Want to take it a step further? Share this post with the women in your life who may want to order and be encouraged in their own spiritual walks! God is so good and faithful and we trust He will bring this into the hands of just the right women. Share on social media using #InTheWaitStudy and follow up on Instagram @IntheWaitStudy!